Residents who live near our municipal parks may notice work being done in their areas in the coming months. The Township recently began work to enhance and resurface a number of athletic courts across Cherry Hill - including the full renovation, with resurfacing and installation of new backboards and nets, of all of our municipal basketball courts, as well as improvements to several tennis courts and hockey facilities around town. Work began last week on two tennis courts at Horace Mann Elementary School, the basketball court at Ashland Park (3rd Avenue at Carolina), and the basketball court at Singleton Park on Willard Avenue. This is just the start of a monthslong program that will ultimately renovate public facilities across Cherry Hill. 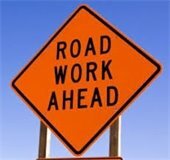 Work is also scheduled at Coles Courts (next to YALE School), Cooper School, Cherry Valley Park, Erlton Park, Kenilworth Park, Lummis Park, Staffordshire Park, Still Park and Willowdale Park. When this season's improvements are complete, the Township will have renovated all municipal tennis courts, hockey facilities and basketball courts throughout Cherry Hill in the course of the last five years, investing hundreds of thousands of dollars in just these facilities alone. Additional improvements are planned at multiple playgrounds; please stay tuned for details. Cherry Hill prides itself on our public recreation facilities, which greatly enhance our community's overall quality of life, encourage residents to stay active, and make our neighborhoods stronger and more vibrant. If you have a suggestion or would like to discuss a question or concern about your local park or playground, we'd love to help; please contact Recreation Director Megan Brown at mbrown@chtownship.com. Mayor Cahn shares an update with the Cherry Hill Chamber of Commerce on May 2. Last Tuesday, I joined the Cherry Hill Chamber of Commerce for a "State of the Township" update during a special luncheon at Caffe Aldo Lamberti on Route 70. It was a wonderful opportunity to meet and interact with local business leaders, and to discuss the great things that are happening in every corner of Cherry Hill. We covered topics ranging from economic development, to improvements and investments within our neighborhoods, to our efforts to preserve and protect open space. Thank you to Debra Arthur, who hosted her first luncheon as Chamber President, for inviting me to the luncheon, to Lamberti's for hosting, and to the dozens of members who turned out to hear our update and ask their questions! Click here for photos. 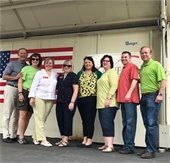 Mayor Cahn, members of Council, and festival producer Brenda Jorett on stage at the 8th annual Sustainable Cherry Hill Earth Festival, April 30. Council and I were proud to welcome thousands of visitors to our historic Croft Farm last weekend for the 8th annual Sustainable Cherry Hill Earth Festival, for an afternoon of family-friendly fun centered on promoting sustainability and sustainable living within our community. It was a wonderful day that included a Family Fun Bike Ride, followed by the four-hour festival featuring dozens of displays, vendors, recycling opportunities, live entertainment, food, a plant swap and much, much more. The members of Council and I had a great time throughout the day, and are thrilled that so many of our neighbors also came out to experience the festivities. Special thanks to Brenda Jorett, the Earth Festival committee and the Township's Department of Recreation -- as well as the dozens of volunteers whose tireless efforts combined to make this year's event an overwhelming success. We are already looking forward to next year's event! To view photos of this year's Earth Festival, visit Sustainable Cherry Hill on Facebook or click here. Councilman Brian Bauerle with Cherry Hill resident Gus Preno and his family at his 100th birthday celebration. Councilman Brian Bauerle was honored to attend the 100th birthday celebration of longtime Cherry Hill resident Augustine "Gus" Preno on April 22 at Tavistock. Gus is a Navy veteran and an original Barclay Farms homeowner who still lives in the home he and his family purchased in 1961. He officially turned 100 on April 13 - and we're grateful to his friends and family for the opportunity to present a special proclamation celebrating his wonderful life. Thank you to his daughter, Chris, and son, Steve, for welcoming us into the family's celebration. We were thrilled to be part of it! Click here for photos. Councll President Dave Fleisher and Vice President Sara Lipsett with some of our community's youngest Star Wars fans this May 4th at Croft Farm. More than 100 faithful fans turned out on Wednesday night to celebrate Star Wars Day during our "Cookies and Wookies" event at historic Croft Farm. Parents and children - many in costume - enjoyed a variety of Star Wars-themed crafts and snacks, had their picture taken with some of their favorite Star Wars characters, and more! Council President Dave Fleisher and Councilwoman Sara Lipsett stopped by to greet our fans of all ages. This year's event was a wonderful success, and our staff had a fantastic time. Thank you to everyone who came out; we hope you had fun, and look forward to seeing you again next year. May the "Fourth" be with you! Council President Dave Fleisher with Susan Rose, who founded Mothers Matter/the Lauren Rose Albert Foundation in memory of her daughter. Council President Dave Fleisher joined hundreds of community members and all 19 of Cherry Hill's schools for the 13th annual Volley for Support tournament. This year's event benefitted the Lauren Rose Albert Foundation/Mothers Matter. What started in 2005 as a small fundraiser within the district has blossomed into a district-wide event with participation from all 19 Cherry Hill Public Schools. Since 2005, Volley for Support has raised more than $200,000 for a variety of worthy causes and local charities. It's a tremendous show of community spirit and support, and a great night for our schools. Thank you to the dozens of volunteers who come together to pull it off. We're proud that Cherry Hill is home to such a remarkable event! Visit our Facebook page for photos. Council President Dave Fleisher (left), Mona Lari, author Sabeeha Rehman, CHPD Capt. Amy Winters, and Jewish Community Relations Council Executive Director David Snyder. Council President Dave Fleisher was among those who attended a special "Author's Talk" last Thursday night featuring Pakistani author and activist Sabeeha Rehman, as she discussed her recently published memoir "Threading My Prayer Rug,“ one of Booklist's Top 10 Diverse Nonfiction Books of 2017. This wonderful event was sponsored by the Cherry Hill Public Library, Cherry Hill Human Relations Advisory Committee, Jewish Community Relations Council of Southern New Jersey and the Pakistan-American Society Of South Jersey. Thank you to all who attended! Mayor Cahn, Council President Dave Fleisher and Councilwoman Carole Roskoph celebrate the Grand Opening of Okimaki Sushi Burrito on Route 70. Council President Dave Fleisher and Carole Roskoph joined me Friday afternoon as we welcomed a new sushi restaurant to Cherry Hill. Oki Maki Sushi Burrito is now open at 2110 Route 70 East, the second location for the store's owners, who started their business in Voorhees earlier this year. Oki Maki offers a new twist on a popular food, with their sushi burrito, as well as sushi cones and other contemporary sushi favorites. Thank you to the store's owners for inviting us to participate in Friday's festivities; we wish you the best of luck in your new location! Cherry Hill Township will celebrate National Kids to Parks Day in local parks across town later this month. On Saturday, May 20, visitors to select playgrounds will receive a free ice cream cone courtesy of the Township. Trucks will only visit select parks/playgrounds, and will only remain on-site for 30 minutes. Tell the Ice Cream Man you'd like free ice cream from Cherry Hill Township to claim your cone! Show your appreciation by taking a picture and tagging us on Social Media: @cherryhilltwp (Instagram); @cherryhilltwp (Twitter); Cherry Hill Recreation Department (Facebook). 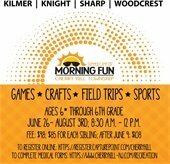 Kids to Parks day is a nationwide effort to encourage children and families to explore their neighborhood parks and discover science, history, nature and adventure right around the corner - and with more than 50 local parks in our community, Cherry Hill is the perfect place to celebrate the occasion. CLICK HERE for a list of parks and times; we hope to see you around town on May 20! The members of Council and I are proud to present a special Bike-In Movie event later this month! Bike over to Old Orchard Park at 7:30 p.m. Friday, May 19, for a special, family-friendly showing under the stars of the animated film, "Up." Refreshments will be available for purchase. Festivities begin at 7:30, when you can play in the park, meet members of the Cherry Hill Police Department Bike Patrol Unit, and purchase refreshments.Movie will begin close to sunset. Admission is FREE! For more information, check our Facebook event, or call (856) 488-7868. Registration is now OPEN for the second Book It 5K, 8:30 a.m. Saturday, Sept. 23, at the Cherry Hill Public Library. The race is a partnership between the Township and CHPL, and will include both the 3.1-mile race, a 1-mile walk, and a 100-yard Kids' Dash. Tech t-shirts will be given to the first 250 5K and Walk registrants; medals will be awarded to the top three male and female runners in each age group. All children will receive a prize following the dash. Visit the Book It 5K Run Sign-Up Page to register online, and for full event details. Thank you to our Wellness Partners, Kennedy Health, Ravitz Family Markets and Virtua for their support of this event.